Summa was originally based on the text of the credo, and Pärt collectors may know it as sung by the Hilliard Ensemble on ECM 1325, the ‘Arbos’ album. It goes to show how many different arrangements and versions there are of Pärt’s earlier ‘tintinnabulum’ style pieces that it appears here for string orchestra, and also the ease with which such a work passes between such seemingly disparate media. This arrangement was made in 1991, and the serene flow of the piece is conveyed nicely on this recording. While inevitably losing some of its liturgical character, the concerto-grosso contrast of ‘solo’ string lines and the massed group with bass easily conjures the call and response structure of a choral prayer. Three of the pieces on this disc also appear on another classic Pärt album, ECM 1275, ‘Tabula Rasa’. This was the Pärt recording in the 1980s and one of the principal artefacts for bringing his name to the popular attention of the wider world beyond Estonia and the rather specialist European contemporary music scene. Cantus was written in response to the death of Benjamin Britten on 4 December 1976 and can be described as a ‘personal threnody’. The music is little more than a descending scale in differing speeds with the chiming of a tubular bell at its tonal centre. It doesn’t sound like much, but its technique is a powerful tool in Pärt’s language. The La Pietà orchestra takes a more intensely sustained view on the music than the Staatsorchester Stuttgart under Dennis Russell Davies on the ECM album, which times at 5:00 rather than 7:10 here. La Pietà’s powerful performance is truly excellent, though the hushed atmosphere at the beginning of the ECM recording has also always been something rather special. It is easy to be dewy-eyed about the qualities of an elderly classic recording one has known and loved for many years, but there is a spiritual aspect to the ECM CD which still makes it an Pärt must-have. With this new recording the bell is a little more prominent in the balance which is a good thing. The opening strings take an early-music non-vibrato approach which is a tad cooler and more remote in feeling than with the Stuttgart players. Tabula Rasa holds a special place in Arvo Pärt’s oeuvre. The haunting sparseness of the musical material and the breathtaking nuances of the prepared piano are all elements which have to be heard, and once heard, will never be forgotten; or at least, they weren’t in my case. It has always been irritating that the two sections of the piece are on one track with the ECM CD, but the team of Gidon Kremer and Tatjana Gridenko on violins and Alfred Schnittke playing the prepared piano is very special indeed. The ECM recording is a live one with a few interesting extra noises here and there, but is ultimately my desert-island choice and probably always will be. There is an element of ‘first heard here is best’ when it comes to this piece, and the prepared piano is destined to sound uniquely different at each performance no matter what anyone does. My objective reasons for preferring the ECM recording in purely musical terms is that the piano sounds seem to relate more to the rest of the music in terms of pitch. The piano also appears more forward in the balance in the older recording, which means its impact is greater, with all of those bass notes chiming through like a grand but distant cathedral bell. ECM album’s Silentium movement starts at 9:36, and I’m guaranteed, at that point, either to shed a tear or just listen with a sense of aching awe. The piano ‘riff’ is something truly magical. The combination of this repeating motif and the slowly shifting harmonies and phrases of the strings and the violin soloists is something which cannot really be described in words. With this Analekta album my nose twitched a little when I saw that Tabula Rasa had been put in the middle of the programme. The experience of Silentium is surely something which can’t be followed by anything else? Whatever, this is a very fine recording and performance. The singing solo lines move with soaring elegance over the rest of the strings, and the sound of the prepared piano, while rather recessed in the recorded balance, hangs in the air like the sound of lightly struck suspended metal plates in the first Ludus section. To deviate for a moment, this spatial effect and quality of sound reminded me of another ECM album, ‘The Music of Stones’ (ECM 1384) by Stephan Micus, and if you like the meditative sonority of Pärt then you will probably very much like that too. Later on in the Ludus movement all hell breaks loose, and it is with this newer recording that we have a huge advantage. The greater definition and clarity means that the impact of the music is far greater, the confusion of noise in the elderly ECM recording being more like a furious band of raging strings in a fight with a Balkan cimbalom player. Here the music is superbly preserved, the greater detail meaning we can follow all of the lines and the passionate logic of its form and structure. There is one impressively strange moment in this section at 8:45 which sounds like a single doom-laden note from an electric bass guitar. This might be the side-effect of an edit removing the attack from a note, but to me has a heroic quality – a player waiting patiently through the entire piece for their one moment of post-modern cross-over magnificence, played to perfection. The Silentium movement is also jaw-droppingly wonderful on this CD, but I am troubled by that prepared piano. This is rich with fine sonorities, but is too recessed to really make the skin tingle, and the actual pitches don’t connect to the rest of the music in the way one would hope. Yes, I am pre-programmed by the ECM recording, so it is hard to be truly objective, but this doesn’t quite do it for me. The strings are wonderful, and if you are hearing the piece for the first time you will probably be ‘well stunned’, as they used to say in youthful parlance. If you are affected by this piece, do yourself a favour, and buy ECM 1275 as well: you may, all of a sudden, find a chasm has opened in your musical foundations and swallowed you whole. With the emotional crisis of Tabula Rasa not being quite as powerful as in my previous experience, following it with the Pilgrim’s Song is less of a wrench, and in fact works very well. Collectors may have this piece on ECM 1795, ‘Orient Occident’ with Swedish forces under the magnificent Toñu Kaljuste. This alternative is more symphonic than with La Pietà, but I like the closer balance of the strings in their recording, the sinister interjections of the lower strings being communicated with more heft and presence. The choir is also very good, and with a shimmering elegiac quality to the orchestra this is one of the highlights of this disc. Mozart-Adagio is the most recent piece on this CD, and employing collage techniques to create an antique-style piece which puts me in mind of some of Schnittke’s explorations of this conjoining of genres and styles. The Mozart work treated to a modern version is the slow movement of the K280 piano sonata, with the tragic elements of the music spot-lit and emphasised with the addition of a violin and cello. Fascinating music, and beautifully played, this is a surprising but entirely suitable addition to the Pärt catalogue. Spiegel im Spiegel is another of Pärt’s pieces which exists in numerous versions, and if you want total Spiegel im Spiegel immersion there are three different and very fine performances on the ECM album ‘Alina’ (ECM 1591). The simplicity of this music has caused some to react with a deal of negativity, but if you know Pärt’s work previous to this alternative phase you might understand how this was a way out of a cul-de-sac of noisy complexity. The quote in the booklet notes says a great deal: “I was writing music in which there were many notes thrown down on the page ... I was not guarding these notes as treasures ... Each note is decisive, every note is telling.” In this way Pärt comes closer to Mozart than most contemporary composers, and just as with Mozart it is very easy to play this music – and even easier to play it very badly. This is most certainly not the case here, and Angèle Dubeau and pianist Louise-André Baril conclude this disc with Spiegel im Spiegel’s enigmatic majesty projected in potent poetic style. This is a disc which can be recommended on all levels, recording, performance, presentation and programme. Ignore the over-used ‘Portrait’ title: it’s just great music played to perfection. My own heaving Arvo Pärt collection and an increasingly rich variety of current options might seem to preclude the need for further recordings of old favourites, but I have found these new recordings refreshing and a welcome addition to my perspective on all of these pieces. 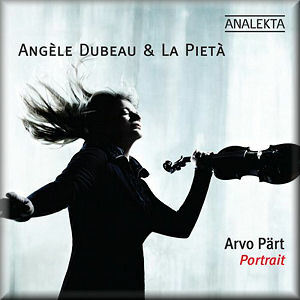 Yes, I will be keeping my ECM 1275, but I will also be tenaciously hanging on to the superb playing of Angèle Dubeau and La Pietà. So, stop hanging around here: go away, buy your own copy; go on, shoo ... allez, vite!